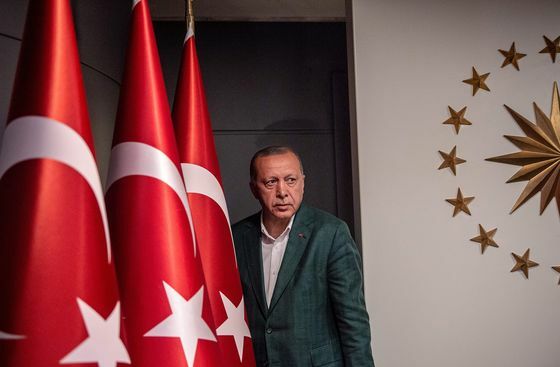 (Bloomberg) -- President Recep Tayyip Erdogan said his ruling AK Party won Turkey’s municipal elections with a wide margin while conceding that some municipalities may have been lost to the opposition. “The next elections are in June 2023 and there is an uninterrupted stretch of more than four and half years ahead when we will focus on serving” the nation, Erdogan said Sunday in a televised news conference in Istanbul after early results. Erdogan’s AK Party-led alliance had 52 percent of the national vote, with 82 percent of the ballot boxes opened, according to the state-run Anadolu Agency. The opposing camp led by the Republican People’s Party, or CHP, had 37.5 percent, it reported. Early results showed the opposition taking control of Mediterranean coastal cities from Erdogan’s alliance and making inroads in the capital Ankara and surrounding areas. The opposition’s candidate in Ankara was ahead by more than two percentage points as of 9:55 p.m. In Istanbul, Turkey’s commercial hub, Erdogan’s ally and former prime minister Binali Yildirim was leading with just under 50 percent of the votes. Turkey has an “important reform agenda” ahead, the president said.